We hear over and over that manufacturers cannot find the right people for their open positions. Applicants often times do not show up on time and lack both basic and technical skills. We have a solution: our nation’s veterans. Vets have demonstrated an ability to work in teams and perform under pressure. Many servicemen and women learned skills in welding, machining, maintenance, and logistics while in uniform. 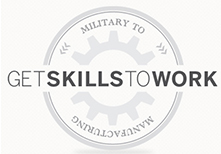 The NAM and the Manufacturing Institute are partnering on a program called Get Skills to Work to encourage transitioning military personnel and recent veterans to look at careers in manufacturing. We have partnered with the Pentagon, LinkedIn and others to offer direct hire opportunities for vets with the skills to step right onto the shop floor. And, we are designing training options in regions around the country for vets to develop manufacturing skills. If you are interested in learning more about these activities, partnering with us on Get Skills to Work, or hiring a veteran, please click here and we’ll (NAM) follow up with you on how you can get engaged.